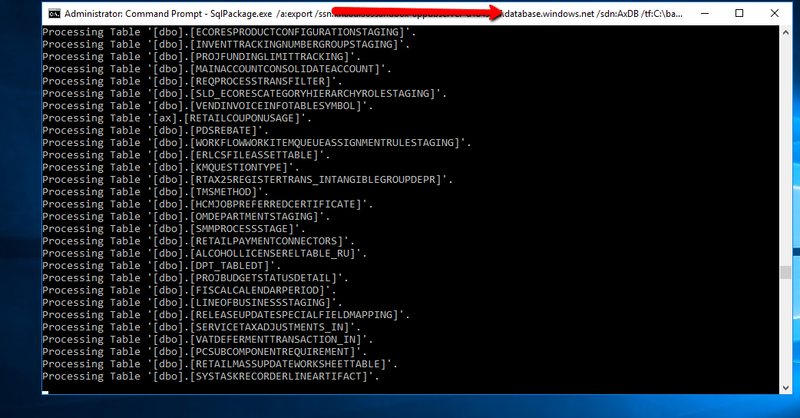 To move a database, you use the sqlpackage.exe command-line tool to export the database from Azure SQL Database and then import it into Microsoft SQL Server 2016. Because the file name extension for the exported data is .bacpac, this process is often referred to as the bacpac process. Create a duplicate of the source database. Run a SQL script to prepare the database. Export the database from the Azure SQL database. Import the database into SQL Server 2016. Run a SQL script to update the database. Now Create Copy of the source database with the help of below script. This SQL statement runs asynchronously. In other words, although it appears to be completed after one minute, it actually continues to run in the background. For more information, see CREATE DATABASE (Azure SQL Database). To monitor the progress of the copy operation, run the following query against the MASTER database in the same instance. Above mentioned schema need to remove from your newly copy database. After above action remove some user manually the script provided by Microsoft will not remove them even throw an error while deleting. So you have to remove them manually. –Prepare a database in Azure SQL Database for export to SQL Server. –Disable change tracking on tables where it is enabled. –Disable change tracking on the database itself. –these will be recreated after importing in SQL Server. –Delete the SYSSQLRESOURCESTATSVIEW view as it has an Azure-specific definition in it. –We will run db synch later to recreate the correct view for SQL Server. –Next, set system parameters ready for being a SQL Server Database. –Clean up the batch server configuration, server sessions, and printers from the previous environment. –Remove records which could lead to accidentally sending an email externally. –Set any waiting, executing, ready, or canceling batches to withhold. Open a Command Prompt window and run the following commands. ssn (source server name) – The name of the Azure SQL Database server to export from. sdn (source database name) – The name of the database to export. tf (target file) – The path and name of the file to export to. sp (source password) – The SQL password for the source SQL Server. su (source user) – The SQL user name for the source SQL Server. We recommend that you use the sqladmin user. This user is created on every Finance and Operations SQL instance during deployment. You can retrieve the password for this user from your project in Microsoft Dynamics Lifecycle Services (LCS). After compilation of Export of the database upload over LCS and download on the target Machine where you need to import database. Retain a copy of the existing AxDB database, so that you can revert to it later if you must. Import the new database under a new name, such as AxDB_XXX. To help guarantee the best performance, copy the *.bacpac file to the local computer that you’re importing from. Open a Command Prompt window and run the following commands. tsn (target server name) – The name of the SQL Server to import into. tdn (target database name) – The name of the database to import into. The database should not already exist. Run the following SQL script against the imported database. This script adds back the users that you deleted from the source database and correctly links them to the SQL logins for this SQL instance. The script also turns change tracking back on. Remember to edit the final ALTER DATABASEstatement so that it uses the name of your database. If change tracking was enabled in the source database, ensure to enable change tracking again in the newly provisioned database in the target environment using the ALTER DATABASE command. To ensure current version of the store procedure (related to change tracking) is used in the new database, you must enable/disable change tracking for a data entity in data management. This can be done on any entity as this is needed to trigger the refresh of store procedure. When copying a database between environments, you will need to run the environment re-provisioning tool before the copied database is fully functional, to ensure that all Retail components are up-to-date. In the Shared asset library, select Software deployable package. Download the Environment reprovisioning tool. In the asset library for your project, select Software deployable package. Select New to create a new package. Enter a name and description for the package. You can use Environment reprovisioning tool as the package name. Upload the package that you downloaded earlier. After the services have been stopped, rename the AxDB database AxDB_orig, rename your newly imported database AxDB, and then restart the three services. To switch back to the original database, reverse this process. In other words, stop the services, rename the databases, and then restart the services.